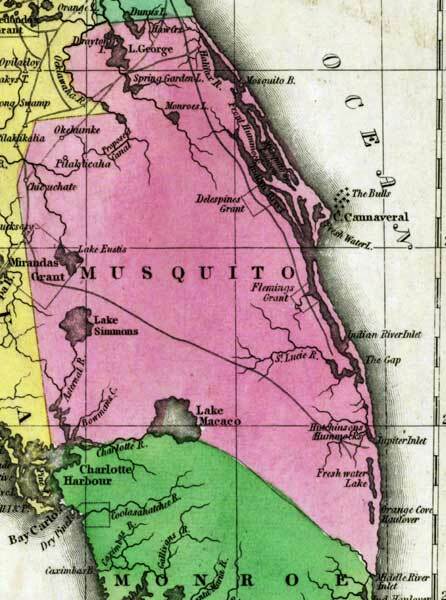 Description: This detail of a 1827 map shows major rivers, lakes, coastal features, settlements, and roads in Musquito County. The county is traversed by many waterways such as the Asternal River, the Saint Lucie River, the Indian River, the Amaxura River, and the Ockawaha River. The coast features Mosquito Beach, Cape Cannaveral, the Indian River Inlet, and Jupiter Inlet. The lakes that are shown are Lake Macaco, Lake Simmons, Lake Eustis, Freshwater Lake, Lake George, Spring Garden Lake, and Monroes Lake. Sections of proposed shipping canals are also shown.